For most of human history, we effortlessly consumed (nose-to-tail) the things we needed for strength, health and happiness. Like the fertile ground that we once walked upon, we were a natural extension of this earth. In the modern world, we unknowingly struggle to fulfill our nutritional needs in order to support and sustain a vibrant, disease-free life. We are now part of a world where pancreatic distress and digestive maladies run amuck. Whole food, nutrient dense organs and glands can provide great benefit for those seeking targeted support in harmony with nature — the old fashioned way, the way that our early ancestors did. 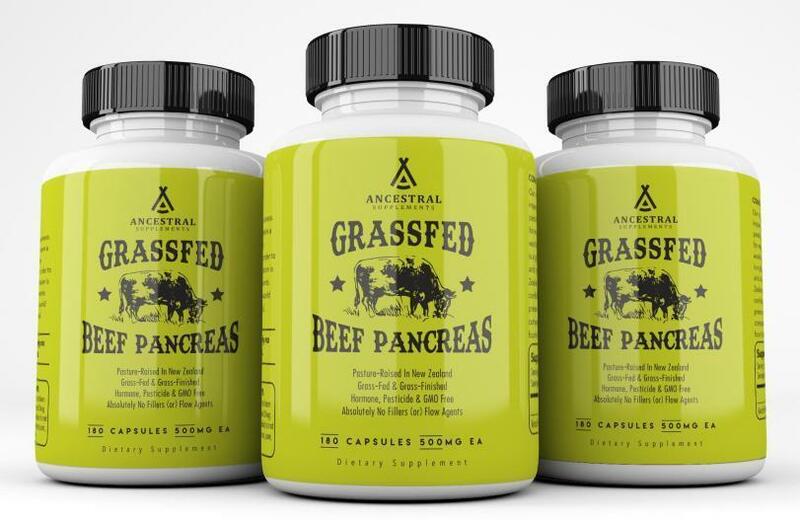 * Grassfed Beef Pancreas is a whole food dietary supplement that provides 100% pure bovine pancreas. This whole food provides proteins exclusively expressed in pancreas tissue along with nutrients, cofactors and enzymes that may support pancreatic and digestive health. * Our mission is our purpose... putting back in, what the modern world has left out. Organ meats were a staple of our early ancestors' diets as the ultimate superfood, for good reason. It turns out, this nourishing tradition is backed by science... "Radioisotope labeling studies in animals have shown conclusively that, when eaten, organs and glands selectively travel to the corresponding organs and glands in high concentrations. This research, done at the University of Scotland in Edinburgh, lends credence to the ancient practice of eating animal organs to help ensure health in one’s corresponding organs..." - Dr. Ron Schmid, ND. *Our early ancestors knew this, which is why their traditional diets included the frequent and nourishing consumption of nose-to-tail organ meats. Six capsules provides the equivalent of one ounce of fresh, raw whole bovine pancreas that you’d get from your local farmer (or) butcher. 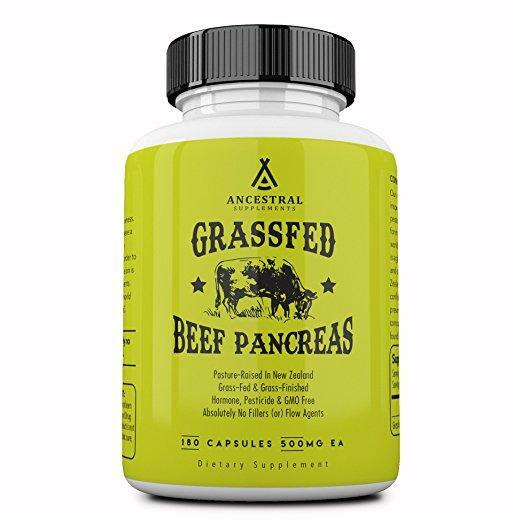 Our Grass Fed Beef Pancreas is a whole food dietary supplement that can be taken with (or) without food (even though it technically is food). The suggested use is 3 to 6 capsules a day or as directed by a healthcare professional. Suggested use as a digestive aid is one capsule three times a day immediately before meals — for added support, the dose can be doubled. Suggested use for all other purposes is one capsule three times a day (between meals) on an empty stomach — for added support, the dose can be doubled. Each capsule contains amylase, protease, trypsin and lipase in the correct physiological amounts that exist in nature. Our product is not a processed, standardized USP extract... it is a whole food dietary supplement for those seeking targeted support in harmony with nature. Okay, you're convinced! You're going to start incorporating organs and glands in your routine because, well... you're educated now... you understand, just as our early ancestors did, that they provide superlative health benefits that are missing in our modern diets. * The next step is sourcing it. It's important that you source the highest quality because not all organs and glands are created equal. Consider the source. Not all organs and glands are the same. Look for the highest quality beef pancreas... It should come from pasture-raised, grass-fed cows that are hormone, pesticide and GMO free. If considering a supplement, look for one that is ultra pure (without binders, fillers (or) flow agents) and look for the freeze dried variety as these have been shown to optimally preserve nutritional factors and co-factors. Our early ancestors were regularly subjected to cold temperatures. It’s most likely why we humans have brown adipose tissue (BAT). BAT is especially abundant in newborns and in hibernating mammals. It is also present and metabolically active in adult humans and its primary function is thermoregulation. * In the modern world though, we are rarely subjected to cold temperatures for any real duration... Let's face it, who likes that uncomfortable frigid feeling that comes with cold, especially when we have access to warmth 24/7. In modern times, we simply put on some clothes… turn up the heater… or we avoid the cold altogether by staying inside. Our potential for strength and health remains encoded in our DNA, and under certain conditions, we can genetically express the strongest, healthiest version of ourselves. Those "certain conditions" almost always have to do with nose-to-tail nutrition. In this instance, it has to do with getting cold. Bakker, Eric, ND. "Glandular Therapy in Clinical Practice." Eric Bakker N.D. N.p., 05 Jan. 2015. Web. 17 June 2017. Murray, Michael, ND. "Pancreatic Enzymes: Key to Powerful Anti-Inflammatory & Immune Support." Dr. Michael Murray. N.p., n.d. Web. 17 June 2017.